MS Access to MySQL database conversion tool is read only and non destructive tool which convert MS Access database records (single or full table) into MySQL database server. No any changes in schemas, attributes, null constraints, key constraints, etc during conversion of MS Access to MySQL even no changes in primary key and foreign keys. 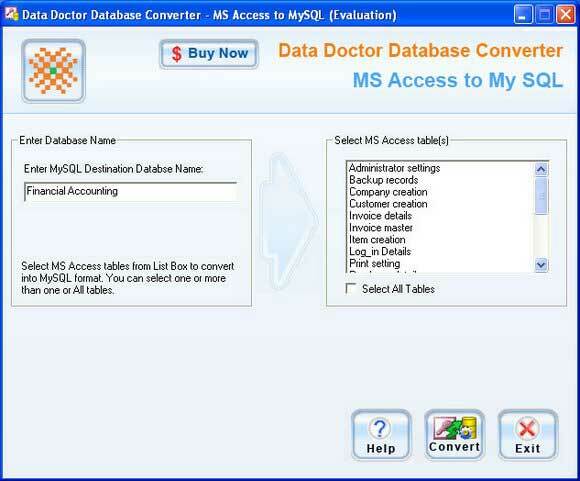 MS Access database conversion tool maintain originality of data and no any changes in relationship among two tables. MS Access to MySQL database server migration program overwrites the resulting MySQL database to the already present MySQL database or save the resulting database as a new file to your favorite place. MS Access to MySQL database conversion tool is based on Unicode architecture and maintains data integrity. MS Access Migration tool is very fast and accurate, compatible with all major versions of MS Access like (Access 2000, 2002, 2003 and 2007) and MySQL database server like (4.x, 5.x, 6.x). MS Access to MySQL data migration tool has the option of save the converted file of MySQL database server at user specific location without and hassles. MS Access to MySQL conversion tool is capable to convert password protected records into MySQL database server. MS Access to MySQL database migration tool is easily install on Windows vista, Windows XP, NT, ME, XP media center, 2000, 2003. MS Access data migration tool features * Support all major version of MS Access and MySQL database server. * Convert password protected MS Access files into MySQL database server. * No any changes in primary key, foreign key and attributes during conversion of MS Access into MySQL database server. * No any technical training required for using migration application. * Based on Unicode architecture ensures full database integrity. * Provide systematic way for using conversion utility. * Easy to install through installation wizard. MSSQL to MySQL database converter software translate database creates in MSSQL into MySQL. MSSQL to MySQL file conversion utility transform single record or whole database to MySQL format. MSSQL to MySQL migration tool supports all version of MSSQL. Data Wizard for MySQL is a powerful Windows GUI utility for managing your MySQL data. It provides you with a number of easy-to-use wizards for performing the required data manipulation easily and quickly. This is software for SMS marketing. Bulk SMS Sender using the GSM modem or mobile phone. It supports long and flash SMS, 7-bit, UCS2 (16-bit unicode) character encoding. Reliable MySQL to Oracle database conversion program facilitates user for complete conversion of database record files from MySQL to Oracle server. Automated MySQL to Oracle DB migration application convert DB records from one format to another. This site does not contain serial number, crack, keygen Convert Access Database To Sql serial number : serial number is the simplest type of crack. A serial number(cdkey,product key,etc) is register the program as you may already know. a crack or keygen may contain harmful software. If you cannot find the exact version you want, just give it a try. for more information read .nfo/.txt/.diz file include in zipped file.